Although I found Venice Beach a bit pretentious as a living environment (think earthen rich hippies touting their extreme health and spirituality who are first to run for the bathroom door, compact mirror and rolled twenty dollar bill in hand, when a vat of cocaine is whipped out at a party), I definitely miss the health food stores and restaurants. In a two-block radius, there were more choices in organic cold pressed juices, fresh nut milks, and creative, raw food options than I had seen prior or since. One of my favorite places was a communal grocery store and deli, which sold fare by locals. This included vats of pickles, cured meats, cheeses, and a wicked sardine sandwich on oiled crusty bread that I still crave. But my most frequent purchase there was the Jade Mountain smoothie. It was a clear plastic cup filled with a gargantuan pile of algae-green, icy, slush that tasted (and smelled) like standing under a waterfall after a day of wicked hiking. It also gave me a boost that lasted hours–not the seedy kind that surges falsely through you from prescription or illicit drugs, but the kind that bubbles through your every cell, wakening the body’s electric flow. I have finally managed, after a few years worth of attempts, to recreate something in my home kitchen that comes close in both taste and feel. Combine all in a NutriBullet and blast away. Sprinkle some extra bee pollen on top to make it pretty! You can learn a lot about a person by looking at their candy profile. Take the Cute Gardener for instance. In life he is rather pointed about what he ingests and what he surrounds himself with. He is balanced and non-indulgent. He likes to maintain a cadre of regularly cherished things that have been tried and are true and give him delight. This lends itself to his cabinet of specialty bourbon, his repetitive varieties of produce in the garden, and his love of high caliber dark chocolate and cacao nibs. Waxy grocery store chocolate will never find its way into his grocery cart and he can smell upon entering a candy boutique whether they are using cheap ingredients or not. For him, his candy profile is direct but not simple, narrowly fixated in high class, not overly fatty and slightly bitter, much like him. Then there was my Grandmother Jeanne. Her home throughout my childhood always maintained the presence of floral shaped crystal dishes on every tabletop in the living room or den that held candy. The candies were mostly hard, translucent and bright like glassy jewels. Not much more than colored sugar individually wrapped in noisy cellophane (impossible to sneak by my greedy little hands without waking the whole household). On Sundays after church she would give us butterscotch gems from her pocket for the car ride home, which she had already enjoyed herself, sucking on one piece slowly during the psalms and hymns. Startlingly, when I saw a psychic in my late 30s, he mentioned the presence of a black-haired woman who watched over me in heaven, who was perpetually taking hard candies from her apron to stick between her pink Max Factor lips and I knew this was Jeanne. She was clear, super sweet, savoring of life and slightly rigid, just like her ever-present candies. She was also a prolific oil painter, which complemented her desire to have bowls as palettes holding the various hues of sweets in her immediate environment. For me, candy has become an occasional event embraced with gusto. I am more in touch with the inviting in of joy and pleasure into my life as a regular occurrence yet as an adult who has learned that balance is the key to all things, for a hedonist like me, this means I need to be careful with abundance. Whether we are talking about my hips, my relationships, or my well being … I have accumulated the habits of one who knows that delving into too much of a good thing isn’t always the best thing for me. So my relationship with candy is a special thing, like going out to dinner for my birthday, which I set up and plan for in advance and enjoy for a brief moment in time. Three or four times a year, I get the itch to visit Sugarfina, which, as I have written about before, offers a treasure chest of delights to a girl like me. When I enter the clear glass jewelry box in Beverly Hills that is its home, I feel like Audrey Hepburn in Breakfast at Tiffany’s. And in fact, the walls of this illustrious candy palace are indeed the same shade of Tiffany blue. 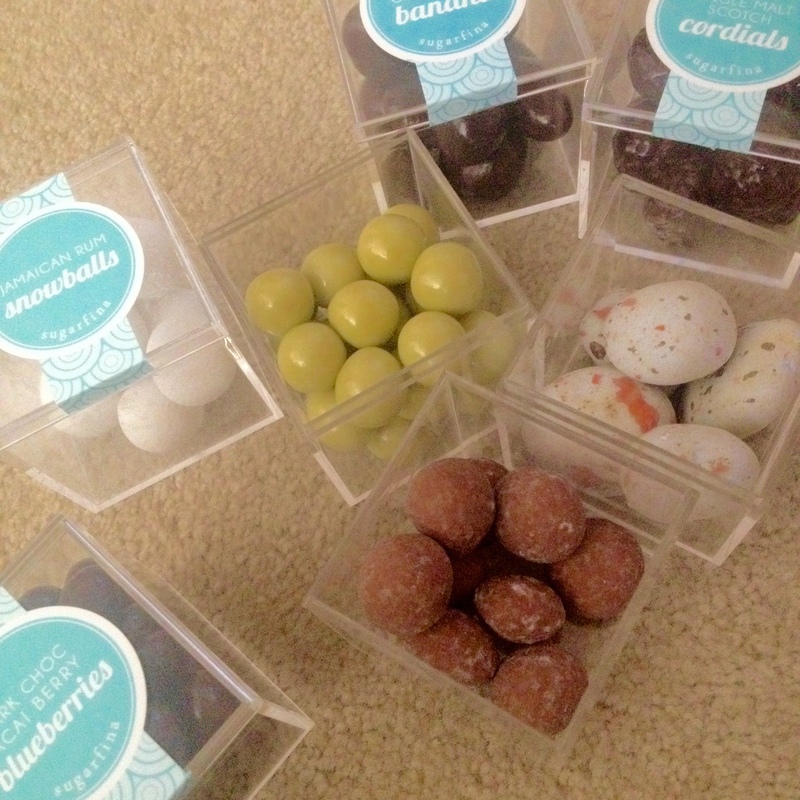 Yes, the tiny clear boxes only hold 5-20 small candies per each. Yes, those boxes range anywhere from $7 to $12 a piece. I know that is an exorbitant amount to spend on candy. But I don’t care because it is a rare and celebrated encounter. There are candies from all over the world, chosen for their unique beauty and attributes, and I like to dabble in such a broad selection. As for my sugar profile, what this says about me, is that when I am being bad I want to be bad with only the utmost quality of sin and I am willing to pay big bucks for it so that I don’t take advantage of my treats or treat the occasion as if it is something that can become a regular thing. These are all careful barriers I put up between me and my love of the sugar rush to ensure I appreciate it while it lasts but am cautious not to partake of all too often. As for my actual choices—they range. They spotlight my fickleness, spontaneity and sense of adventure. They also denote other smaller idiosyncrasies of my personality and tastes such as a constant desire to try new things. On my most recent visit I stocked up on Jamaican Rum Snowballs and Scotch Cordials-each filled with real liquor to satisfy my current love of dessert and booze combinations like the cocktails Brandy Alexander and White Russian. A box of matcha covered caramels matches my interest in traditional Chinese medicine and the healing elixir of green tea. A cube of dinosaur egg-reminiscent Dionysus Dark Chocolate Covered Walnuts piques the lover of Greek god/goddess culture in me with its fortifying nuts imported from the place that boasts the birth of knowledge and my inner mourning for the lost library of Alexandria.The soft outer layer of the Toffee Peanut Butter Truffles reminds me of the basic flour and peanut butter balls stuck in the center with an M&M that I used to make in preschool. It was a primal snack made with messy fingers and fun and now this adult version comes stuck in the middle with surprising bits of chewy gourmet toffee. The Acai Dark Chocolate Covered Blueberries make me feel as if I am incorporating superfoods into my decadence and along with the Dark Chocolate Covered Bananas, fulfill my cravings for small, sweet bites to accompany my morning or afternoon tea time. It is very ceremonial how I set up these beautiful little boxes under the coffee table vowing to have one piece a day until they are gone. Then the boxes get relegated to the LEGO collection where they become transparent containers to separate parts. In actuality, what ends up happening is that I use this functional need for the LEGOs as an excuse to make the candies disappear a little more quickly than intended and my Sugarfina affair slowly dissipates over the course of a week or two. And then I become a normal human again, content to ignore the leftover Mounds bars in the hallway bowl leftover from Halloween.